The number of capital city auctions held this week was 1,053, falling significantly given most states and territories have a public holiday today. Preliminary results show that 67.2 per cent of auctions were successful this week, compared to 68.2 per cent last week across 2,008 auctions and 75.9 per cent one year ago, across 2,076 auctions. 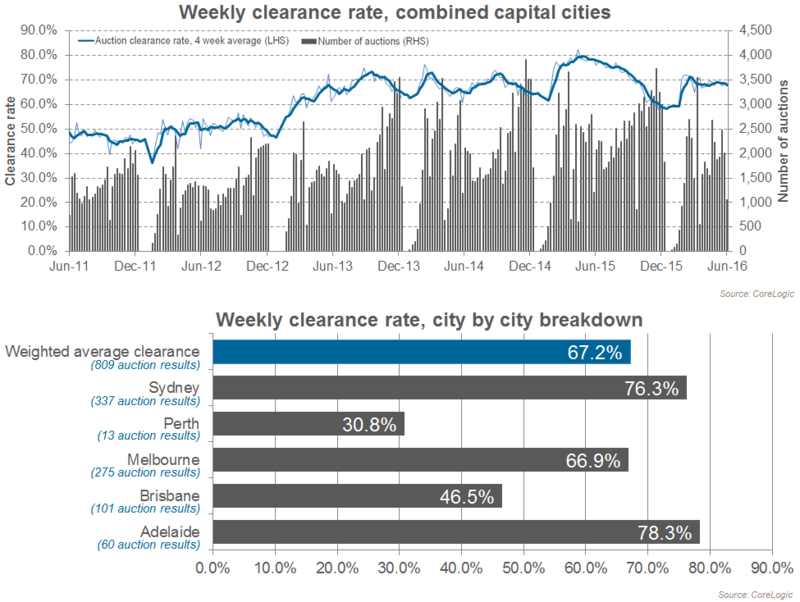 Since the end of March this year, the combined capital city auction clearance rate has been trending around the high 60 per cent mark, demonstrating an improvement when compared to the end of 2015, however consistently tracking lower compared to the same time last year when across the combined capitals, clearance rates were in the mid to high 70 per cent range. was the second busiest city for auctions this week, with 337 homes going under the hammer. Of the 275 reported results, 184 were successful, representing a preliminary clearance rate of 66.9 per cent, a fall from 71.1 per cent last week. Prior to the lower volumes this week, over the past four weeks, Melbourne has maintained a clearance rate in the low 70 per cent range, representing stable conditions across the market. Last week, Melbourne’s clearance rate was 71.1 per cent, while last year it was 77.7 per cent. Preliminary results across the individual sub-regions of Melbourne show that the South East was the busiest for auctions this week, with 56 being held and a preliminary clearance of 55.3 per cent. In comparison, the best performing sub-region was the Mornington Peninsula with a stronger clearance rate of 93.3 per cent, based on 15 results. This week, 427 Sydney homes were auctioned and preliminary results show 76.3 per cent were successful. Although auction volumes are lower than they were last week, when 692 were held, Sydney hasn’t seen the same fall in activity that Melbourne has and is generally less influenced by public holidays. This week’s preliminary clearance rate for Sydney represents a rise from last week (72.9 per cent), however it remains significantly lower than the clearance rate from one year ago (83.4 per cent). In Sydney, three sub-regions recorded a clearance rate above 85 per cent this week: Northern Beaches (95.5 per cent), Eastern suburbs (86.1 per cent) and City and Inner North (86 per cent). With no public holiday for Brisbane, auction activity remained relatively stable, with 139 auctions held across the city, up from 130 last week and steady in comparison to one year ago when 135 auctions were held. The clearance rate, however, fell from 48.2 per cent last week to 46.5 per cent this week. At the same time last year, 45.5 per cent of reported Brisbane auctions were sold. Further south, across the Gold Coast, 39 auctions were held this week and preliminary results show that 58.8 per cent of the 17 reported results were successful. In Adelaide, a 78.3 per cent preliminary result was recorded this week across 73 auctions, which is the highest clearance rate the city has seen all year. Last week, 98 Adelaide auctions returned a clearance rate of 60.7 per cent for the city, while at the same time last year 58.7 per cent of Adelaide’s auctions cleared. Perth’s preliminary clearance rate was 30.8 per cent this week, up from just 13 per cent last week, across 23 results. This week 41 Perth homes were auctioned, while 13 results have been reported so far. At the same time last year, 31 per cent of Perth auctions cleared. Over the past couple of months, Canberra’s auction market has shown a varied performance, after beginning the year with consistently strong results. Preliminary results show 66.7 per cent of Canberra’s auctions were successful this week, up from 52.4 per cent last week and lower than the recent high of 70.5 per cent over the final week of May. One year ago there were 53 Canberra auctions and 68.9 per cent were reported as sold. Tasmania was host to 8 auctions this week and so far 5 have been reported with 2 sales.